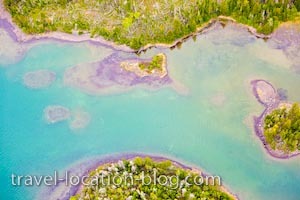 Intriguing aerial picture of forested islands surrounded by the crystal clear waters of Lake Superior, Ontario, Canada. The view from above was stunning during a flight over Lake Superior. A multitude of islands dot the great lake and from the air we could see that their roots are well seated under the water surface. The see-through turquoise water revealed rock formations and patterns below the surface while trees carpeted the surrounding islands.